Dr. Katherine Lacsamana Ola is humbly welcoming patients, particularly the Filipinas, to a practice which provides genuine caring and compassion committed to exceeding your expectations for service, access, efficiency and trust. 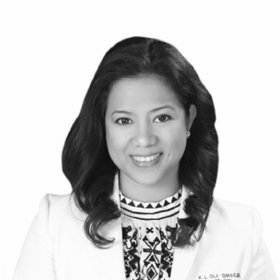 Dr. Ola brings with her 10 years of clinical exposure in the OB-GYN field and 6 years of working experience both as medical officer in government hospitals and an active consultant staff at several private hospitals in the Philippines. She obtained her medical degree at St. Luke’s Medical Center, the first hospital in the country, with a 650-Bed capacity, to be accredited by the Joint Commission International (JCI). She had her specialty training in OB-GYN at Dr. Jose Fabella Memorial Hospital and Tondo Medical Center, both institutions, well known in her home country for extensive maternity and gynaecological services She has been conferred as a Diplomate, by the Philippine Obstetrics & Gynecologic Society (POGS). She has an intense interest in research and field works. Her study on “The Antibacterial Effects of Intravaginal Vitamin C on Bacterial Vaginosis on Non-Pregnant Women,” has won in a national research contest conducted by POGS. Exposed to a vast number of different cases and patients, she has a strong ability to work under extreme pressure of childbirth and delivery procedures. She is updated with changes and developments in the field of OB-GYN. Dr. Ola describes the Filipina patients as generally “mahiyain” or shy, being that said, her particular interests on reiterating that concerns regarding women’s health, diseases, sexuality and fertility are sensitive issues and therefore assures them that she can serve as their confidant who will see to it that they will feel comfortable and treated with respect without compromising the utmost care that they need. She has conducted/facilitated lectures and seminars to women of reproductive age and allied health workers on issues concerning reproductive health, hygiene and disease prevention.